The Arlington Conservation Council's 4th of July float drew attention to the Dark Sky movement.​ Photos by Paul Knudsen/ArlingtoNow.com. Every year, the Arlington Conservation Council uses Arlington's 4th of July Parade as a vehicle to broadcast an environmental message. In years past, the nonprofit has driven home - via their homemade floats - the importance of Texas wildflowers, state birds and solar power at the popular annual event. 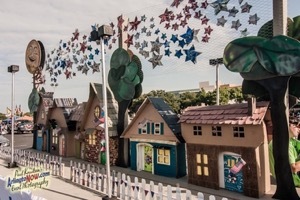 After winning the Grand Prize at last year’s parade, the 50-year-old environmental group came back last week to win best Non Commercial Float for their entry themed "Turn on the Night" about light pollution. Marian Hiler, ACC’s float director, said when they learned that this year’s theme was Star-Spangled Independence Day, they saw an opportunity to call attention to the Dark Sky movement. 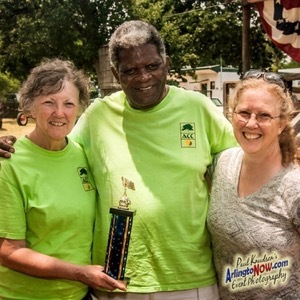 ACC members Marian Hiler, Roy Miliner and Ann Knudsen accept the trophy for Best Non-Commercial Float at the 2018 Arlington 4th of July Parade. The International Dark-Sky Association was founded in 1988 to advocate for the reduction of artificial outside light, which robs city dwellers of the starry night sky, contributes to global warming and impacts the routines of wildlife. In addition to their advocacy of various green causes, ACC strives to use only scavanged material in their entries. In previous years, members spent weeks gathering old pizza boxes, ice cream container lids, plastic utensils and bottle caps to craft their creations. This year ACC member Mike Kolanko helped build the foundation of the float, featuring a row of houses made from shipping boxes and wood scraps. A milk carton served as a chimney. ACC volunteers decorated them with bits of colored cardboard and paper. The moon was tinted with coffee grounds. “We don’t use paint because then you can’t recycle the cardboard after it’s painted,” said Hiler. Aluminum cans collected by ACC members were carefully cut out to make stars, which hung on chicken wire. Replicas of fully shielded streetlights that reduce light pollution were mounted on poles. A hand-crafted eagle salvaged from a previous year's float perched atop for another run. Hiler wasn’t sure how well their theme translated to the crowd but hopes some people got the message.